Bring musical inspirations to life and enhance your creativity with the blazingly fast and intuitive Notion™ 6 music composition and performance environment. Compose traditional notation, tablature, or lead sheets when and how you want—on Mac®, PC, or mobile—even with your own handwriting. Create music directly on the staff, record or enter notes quickly with a MIDI instrument, or use the integrated virtual Keyboard, Fretboard, or Drum Pad. 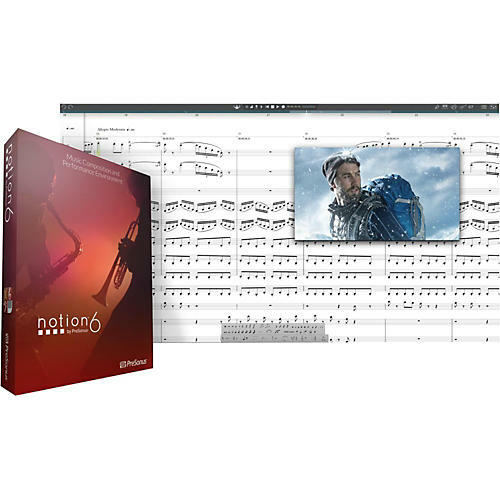 Create and perform music with the full realism of samples recorded by the London Symphony Orchestra at Abbey Road Studios; Guitars by Neil Zaza, Electric Bass by Victor Wooten and Drum Kit by Roy Wooten; Olympus Micro Choir and Lakeside Pipe Organ by Soundiron; plus enhanced VST support and bundled PreSonus FX. Take projects to the next level with deep studio integration including audio/MIDI streaming with any professional DAW via ReWire and unprecedented integration with PreSonus Studio One®. Even set music to film with advanced video capabilities. Deliver your final professional scores and polished performances with new layout controls: use MusicXML to transfer between other notation and music apps, and export WAVs or MP3s with instant SoundCloud sharing. No other notation software has more options to take your music on the go. Seamlessly switch between your Mac/PC and your Windows® Tablet, iPad® or iPhone® (with Notion for iOS available separately)—even perform scores with Notion as your live instrument.